Particle size distribution is difficult to optimize, scale-up and analyze. 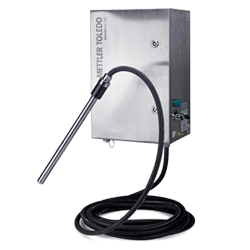 With ParticleTrack with FBRM technology and ParticleView with PVM technology, METTLER TOLEDO is the world leader for real-time in situ particle system characterization and analysis. The ability to measure particles as they naturally exist in a process has dramatically improved the ability to understand, optimize and control particle and droplet systems. Since acquiring Lasentec in 2001, METTLER TOLEDO has continued to advance the development of FBRM and PVM. With thousands of installations worldwide from the R&D laboratory to the manufacturing plant, our probe-based technologies are acknowledged as the gold standard for particle size distribution analysis. Our technology measures and visualizes the rate and degrees of change in particle and droplet systems as they naturally exist in process. Probe-based instrument inserted directly into a process to study how particle size and count change over time with Focused Beam Reflectance Measurement (FBRM) technology. Probe-based instrument inserted directly into a process to visualize particles using real-time microscopy with PVM technology. By monitoring particle size and count in real time, scientists can understand, optimize and scale-up processes confidently using evidence-based methods. By tracking changes to size and count, as particles naturally exist in process, scientists obtain process understanding safely and with no time delay - even at extreme temperatures and pressure. By tracking particle size and count continuously as experimental conditions are varied, it is possible to optimize processes and obtain fit for purpose particles on a consistent basis. By monitoring manufacturing processes, upsets can be identified quickly and improvements can be made using evidence collected at full production scale. By obtaining real time microscope images of particles as they exist in-process, scientists obtain immediate and comprehensive process understanding for every particle system. By visualizing crystals, droplets and other delicate particle structures, scientists can characterize transient events and elusive mechanisms that are critical for process and product quality. By visualizing particles and particle mechanisms inline, scientists acquire unique understanding that supports smarter process development at a lower total. This white paper discusses strategies to optimize crystal size distribution during process development and manufacturing. Three world-class crystallization researchers present how to deliver significant improvements in crystallization process design. This safety manual supplements the ParticleView V19 with PVM Technology Hardware Manual. This manual covers safety and quality information relating to the ParticleTrack G600Ex with FBRM (Focused Beam Reflectance Measurement) technology. Acquire and share process knowledge by viewing particles in real time to understand particle size, shape and concentration with iC PVM Software.